Fire Salts are dropped by flame atronachs. Fire salts are dropped by both flame atronachs and flame thralls. Stoking the Flames: Find 10 fire salts to restore Balimund's forge. 10 samples are needed for this quest. 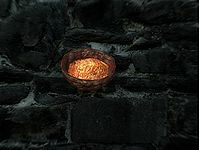 Fire salts are needed at the Atronach Forge to create various flame atronach-related items, namely: a hostile flame atronach, a Scroll of Conjure Flame Atronach, a Staff of the Flame Atronach, or a Spell Tome: Conjure Flame Atronach. (DG) Once certain schematics are discovered during the Ancient Technology quest, one pinch of Fire salts is required for crafting a lot of ten of the Exploding Steel Bolt of Fire as well as for creating a lot of ten of the Exploding Dwarven Bolt of Fire at the Gunmar's Forge. Esta página foi modificada pela última vez à(s) 03h49min de 1 de março de 2015.